Mrs. Hankinson's Class: Shark Week! 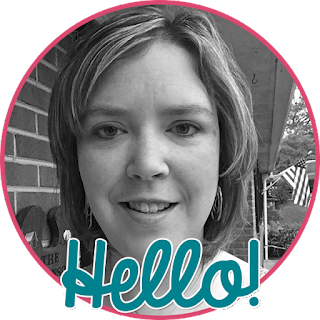 I am so excited to be part of this shark week blog hop! My youngest daughter just loves sharks and we have the DVR already set to record like crazy this week! 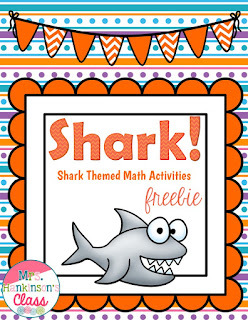 My shark freebie for you is perfect for your kinders or firsties! Click on any of the images to download your freebie. ... and addition double facts I Spy with a recording page. 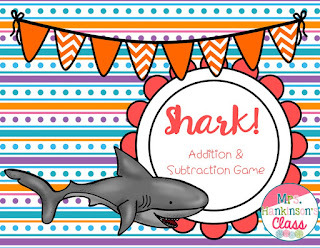 If you like the freebie, it is part of my paid shark math unit on TPT. Be sure to HOP over to Margaux at Learning with Sunflower Smiles! Your telling time game is adorable - thank you for sharing it! Such fun activities! I have been working on time with my daughter and this game will work really well for where we are at the moment. Thank you. What a great set of games to keep kids playing while they learn! Thanks so much for joining in our blog hop!